After Desert Storm the unit moved westward in Germany and sent a brigade to Fort Riley, Kansas. The division headquarters moved from Ansbach to Bad Kreuznach, and later on to Wiesbaden. The division headquarters is planned to relocate to Fort Bliss in 2011. The 1st Brigade cased its colors on 20 April 2007, ending 65 years of military presence in Germany. 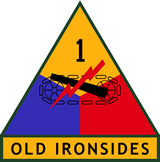 2d Brigade remained assigned to 1st Armored Division until 15 July 2009, when it was reflagged as the separate 170th Infantry Brigade. On 28 March 2008, the 3rd Brigade, 1st Armored Division (HBCT) inactivated at Fort Riley and reflagged as 2d (Dagger) Brigade, 1st Infantry Division (HBCT).